Leora Beach is the perfect combination of luxury and intimacy that will create an atmosphere of relaxation you have dreamed of. The complex prides itself on its high-quality apartments, which all offer ocean views, so you'll enjoy beautiful romantic sunsets from the privacy of your own room. 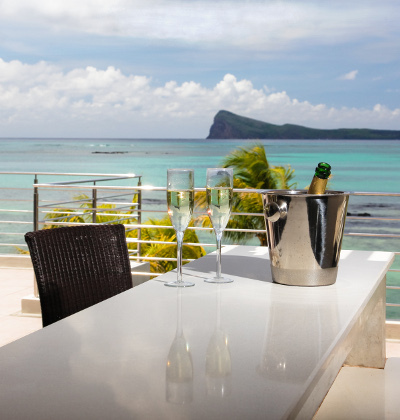 With all the terraces of the complex pointing towards the sea, every day of you will wake up to the majestic view of Coin de Mire rising out of the sea on this paradise island. In calm, but extravagant surroundings you can enjoy your holiday in perfect peace and harmony. This is the ideal place to celebrate special occasions. If you want to enjoy amazing sunsets in a brand new resort with modern designs and fittings, then Esplanade is the place for you and your loved ones. The intimate apartments will allow you enjoy your much-needed leisure time. The stylish twin-complex resort offers one of the most luxurious holidays you can imagine. Located directly on the beach on Mauritius’ west coast, you will be able to experience breathtaking sunsets. This ultra-modern environment by the sea will ensure that you have an unforgettable holiday. With its cozy ambiance, this resort is the ideal place for your next family holiday. The location also creates the perfect romantic atmosphere for honeymooners and couples. Your stay here promises to be more than just another holiday. It does not have to be a dream staying in a luxury apartment on a paradise island. Our attractive complexes can offer you all of this and much more. More of them are located in a lush tropical garden surrounding modern buildings with carefully chosen fine interior. It's perfect for families seeking an unforgettable, well organized holiday, couples looking for a calm place to be together or even business people who would like to come into an oasis of relaxation after work is done. Your entire holiday can be planned by special staff offering trips and sightseeing adventures around the whole island. Weddings, birthdays and other special occasions can be planned, as well as services like babysitting, cookery classes and massage therapy are available. The goal is for you to forget about your worries and spend a memorable, relaxing holiday. If your interest is aroused, then read more about the 5-star accommodations and start planning your holiday now. The west coast, in the northern part of the island, is best known for its miles of white sandy beaches and crystal clear water. However, this area offers a lot more than just a place of relaxation; in this region you can also discover Mauritius' culture and history. A two-minute drive from Grand Baie will take you to Pointe aux Cannoniers. Despite its size it offers visitors a wide range of attractions. On one side of the road, you will find many eye catching boutiques and also a variety of different restaurants. For those who miss the European cuisine, 'La Cigale' is the perfect spot. Enjoy the food; if you need to work off those few extra calories, you pop into a near-by fitness centre for a quick workout. Before leaving Pointe aux Cannoniers, tourists should visit the hotel 'Le Cannonier'. Walking around the grounds of the hotel you will find an interesting old lighthouse which was in use from 1855 until 1932. As you continue your tour of the area you will pass by Mont Choisy public beach with its shady casuarina trees and small vehicles selling snacks. Within a few minutes of the beach is the Mont Choisy village. This village shares a common beach with Trou aux Biches and both villages are interconnected. Here you may find the diving school 'Blue Water Diving Centre' and access to the beach. Don’t forget to visit the pier where you can rent a boat for big game fishing or just enjoy a relaxing water tour. The real Trou aux Biches starts after the beautiful decorated street – lined with colourful flowers on each side. From there you should discover the public beach where you have the chance to get a small snack and sit under the shady trees. Here, the long palm-tree-lined beach stretches out and invites visitors to take pleasant stroll. If you are looking for more excitement, then you should try parasailing, waterskiing or other water sports. In Trou aux Biches there is also a unique marine safari with an undersea boat. If you want a more personalized, intimate experience, you can explore the undersea world with a 'Scuba Doo' a type of underwater scooter. In the village centre you will find fruit and vegetable stalls selling a variety of seasonal produce. There is also a small supermarket 'Chez PoPo' to provide you with basic needs. The central area also has ATM's and currency exchanges. 'Bon Azur' is located at the end of the Trou aux Biches. The resort offers you a peaceful and quiet holiday in a noble atmosphere. The area, with its beautiful beach and volcanic rocks invites you to sit back and relax in comfort. Located just behind Trou aux Biches is Pointe aux Piments; because of its proximity you will hardly notice that you are entering another village. This area should be a must see for any tourists. You cannot afford to miss the village’s aquarium and the opportunity to explore the underwater world without getting wet. In this quiet village – similar to Trou aux Biches – is 'White Oaks,' another holiday apartment complex which also offers the perfect relaxing getaway. On your way out of Trou aux Biches, heading towards Triolet, you will find the 'Maheswarnath' Hindu temple, the second most impressive Hindu temple after 'Grand Bassin' in the south. After taking time to visit the temple, you should take the time to go the extra few miles to Triolet. This town looks like a colourful big bazaar. The main road stretches through the entire town and you will see many kinds of shops which sell everything from household items to a variety of cloths. Triolet has a largely Hindu population so you will notice many small colourful Hindu temples lining the road. Fruit and vegetable stalls, small huts with traditional food and a large 'Winners' supermarket can also to be found. Cap Malheureux – literally means the Sad Cape; there are two popular theories as to how the area got its name.The first is reference to the English who landing at this spot and the oppression of the colony that followed. The occupation finally ended with the island’s independence in 1968. The alternative meaning relates to the local romantic and tragic love story of Paul and Virginie. As the legend goes, Virginie drowned just off the coast of Cap Malheureux as she attempted to get back to her one and only love. Local say that if you listen carefully you might hear her cry out to Paul on the wind. This small village in the north of the island is quiet and peaceful – despite its name – and nearly untouched by tourists visiting Mauritius. This makes it the perfect 'out-of-the-way' get-away. It boasts wonderful sandy white beaches with views across the azure blue sea to the island of 'Coine de Mire' which juts unmistakably out of the ocean. Not to be missed is the little Catholic Church with its red roof, which is featured on many postcards. The beach has many different facets from the really narrow rocky paths to the idyllic open spaces. Located only five-minutes from Cape Point, it is the perfect area for a truly relaxing holiday. The beach beckons visitors to go for long walks or to take a break under a flamboyant tree to soak in the breath-taking scenery. For those who enjoy water activities there is an exciting solar undersea walk, or you can spend the afternoon snorkelling and exploring the underwater beauty of the abundant marine life. If you enjoy diving, the 'Sindbad' school is just a two-minute walk away. About a 10-minute drive by car, you will find 'Péreybère' with its beautiful beach and bay. The area is framed by its lava flows, palm trees and the turquoise water stretching out forever. Directly on the beach you can book a catamaran tour to Îlôt Gabriel or organize a day-trip to visit, by speed boat, Île aux Bénitiers. For those who prefer to go out to the local reef, snorkelling is also offered. A variety of different restaurants from Chinese to Creole and Indian cuisine makes this area an ideal spot to work up an appetite especially as they are all within easy walking distance. On specific nights you can watch or join in the fun of a Sega dance at the 'Red Cat;” this is an activity that is highly recommended. Péreybère also has a variety of small bars and lounges that are open later in the night for people who want to keep the festivities going. For that special memento to take home, there are a variety of shops in the area as well as a large supermarket where you can get all your daily needs. People can also withdraw cash from a local ATM. On weekends and public holidays tourists have the opportunity to experience the area’s culture at Péreybère beach as it is a popular spot for local to come and relax. You will enjoy the opportunity to watch people have fun, sing and dance as they organize a picnic. If you are looking for more hustle and bustle you should visit Grand Baie which is just another 5 minutes away. This small town is widely known for its night life. There are many different clubs and bars which are open late allowing you to explore the Mauritian night life. You will also find a wide range of shops, banks and ATMs and a large supermarket 'Super U' for all your basic necessities. During your stay, be sure to take a stroll along Sunset Boulevard and explore the town’s exclusive boutiques or find the perfect bargain at the Bazaar, located in the centre of town. The enormous bay is a panorama of boats where it is possible to book trips to all the small uninhabited islands or just go snorkelling or diving. At sunset, enjoy a refreshing drink while watching the colourful lights dancing on the water of the bay. Dining at the 'Beach House,' which is located directly on the beach, is a great way to relax and enjoy the breathtaking view of the water. Grand Baie offers everything a tourist's heart could desire.